Heronfield in the semi-finals of the AUTHORSdB Book Cover Contest 2013! 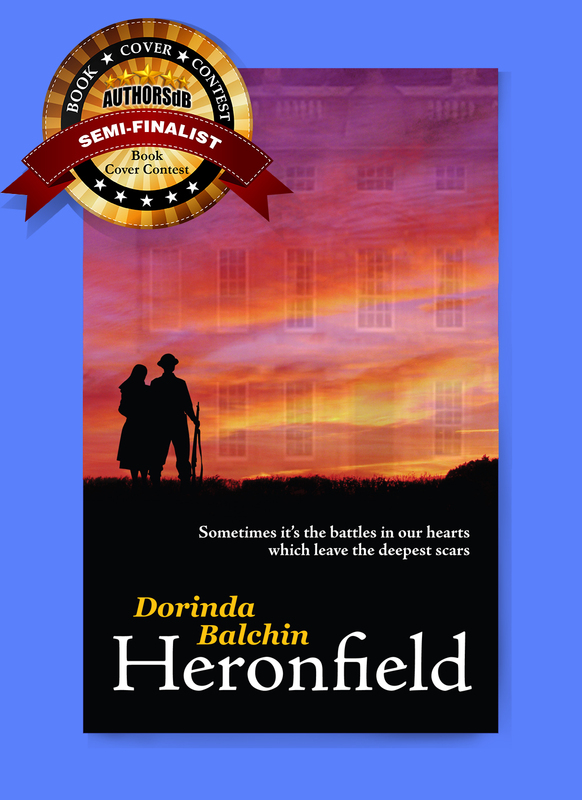 I have received some great news which supports all of the very positive comments I have received about the design of the cover for Heronfield – it has reached the semi-finals in the war/military section of AUTHORSdB Book Cover Competition for 2013. Please do take a look and cast your vote! (Voting from 23rd November to 15th December). Many thanks to my friend, Lorna Gray, for the design. She is a very accomplished artist and you can see more of her work here. Lorna will also be designing the cover for my soon to be released novel, The Guardians, and my work in progress, Rebekah. Take a look at the covers in the other categories too, some of them are real works of art. Yet another 5* review for Heronfield. Having read a number of books set in the war, I started to read this book with a certain amount of trepidation – too often authors are not able to convey the real sense of what it must have been like to be in that situation. “Heronfield” was a most ‘pleasant’ surprise (I use the word ‘pleasant’ in quotation marks as I have to admit that some of the descriptions were unpleasantly graphic – but even this added to the feeling of reality and authenticity) in that it was obvious that the author had not only spent a great deal of time researching her subject, but had complete immersed herself in it. From the descriptions of pre-war life in the big house, to the description of life in an interment camp, the whole novel had a feeling of authenticity and was able to indicate to me what it must have been like to have been alive during that whole dreadful period – not just a serving member of the forces, but also the civilians living (or existing) back at home and how they coped. Ms Balchin is a relatively new author, however, her style of writing reminds me very much of the style of Nevil Shute – an author I have gone back to time after time. I suspect that Ms Balchin will have a similar effect. Is the Amazon Review system fair? Many authors are questioning that validity of Amazon reviews at present. I can sympathise. Some people who have read Heronfield, but not purchased it from Amazon, have tried to review the book but the reviews do not get posted. You can imagine my surprise then, on 2nd November 2013, to find a book to be published on 7th November 2013 already reviewed and ranked! So what star rating does this unpublished book have? 10 reviews with an average of 4.1* On the kindle page Amazon states ‘This item has not been released yet and is not eligible to be reviewed. Reviews shown are from other formats of this item’. In fact it has not yet been released in any format and the reviews are from Amazon Vine. What is that you ask? Amazon says ‘Amazon Vine invites the most trusted reviewers on Amazon to post opinions about new and pre-release items to help their fellow customers make informed purchase decisions’. As an author, I know that I would like to get my books reviewed by as many people as possible, so I can hardly criticise someone else for feeling the same. However, Amazon Vine does not appear to be available to self-published authors (please do feel free to contact me and correct me if I’m wrong). All I would argue for is a level playing-field for all authors. Do you think this system is fair? Can an unpublished book actually be regarded as a ‘classic’? Finally though, as a new author, I recognise that no matter what system Amazon uses reviews are incredibly important for building the reputation of an author, and for sales. I would therefore like to thank the people who have been able to post reviews for Heronfield. I value your feedback to help me to become a better writer, and to produce other books that you might like to read as well. All of your kind words and encouragement are much appreciated! Another great review for Heronfield! 4.0 out of 5 stars I’d give this 4.5 stars if I could! Thank you Sarah for your great review on Amazon. I understand what you say about ‘literary coincidences’, they can sometimes spoil a good story. I did a great deal of detailed research for the book and would just like to put your mind at rest – The SS did send people who did that type of work to ‘that place’ towards the end of the war; the other character was with a unit that was in the area on that day. So while it was a big coincidence, it was not impossible that they would meet there! For anyone who has not read Heronfield and wonders what that is all about – maybe you’re missing out on something!